Heat up the oven to 225°C, (205°C for fan assisted ovens), gas mark 7. Throw the chicken, 2 tbsp vegetable oil and the Crispy Chicken Seasoning Mix into a plastic freezer bag, close and shake until the chicken strips are coated in the rich spices. 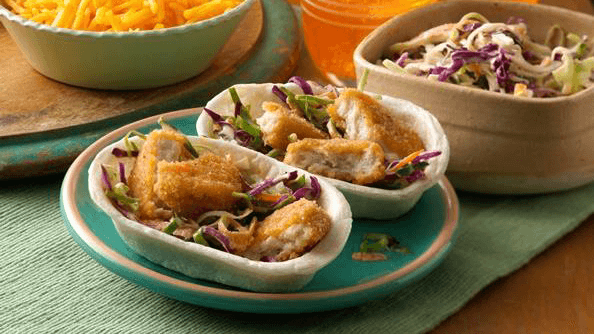 Lay the chicken strips out on a baking tray and throw them in the oven for 18 minutes until the chicken is cooked through, golden brown and crispy. In a medium bowl, mix mayonnaise with taco seasoning mix and stir in cabbage. Fill each warmed tortilla with cabbage mixture, chicken and cheese. Drizzle with barbecue sauce. Enjoy!